Who is ready for cooler weather? Me! Me! Me! Our temperature did drop some this weekend leaving the Midwest sunny in the mid 70’s. This just makes me ready for fall. Trying to move things along, as the cooler weather arrived, I cooked a very yummy and comforting soup. It was so good and a winner for our family. I wish I could remember where I found this recipe. I wrote it down about a year ago but never made it. I am so glad I finally tried it out. We will be adding this to the cool weather recipe rotation. I hope you enjoy. Woo hoo for White Bean Chicken Chili! Comforting slow cooker white bean chicken chili will become a family favorite. Pour beans, chicken, and onion in the slow cooker. In separate bowl add cream soup, chicken broth, taco seasoning, cumin, and green chilies and mix well. Pour soup mixture over beans and chicken. Stir and mix well. YUM!! 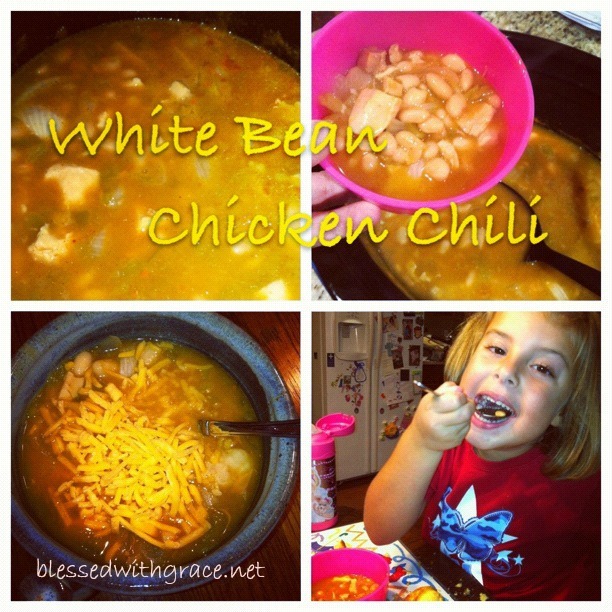 We LOVE white chicken chili! Thanks for the party! Chili looks yummy, one of my favorite foods! That looks like great Chili, I will be having the annual Texas Star Chili Cook Off in October, you will have to bring this Chili over. Hope you are having a great week and thanks for hosting! Thanks for hosting! While I wish it would stay hot all year around, I would gladly eat a bowl of your chili, even in our 90 degree weather. Your chilli looks great! Thanks so much for hosting! Thanks for hosting! 🙂 It looks delicious! I’ve never had chicken chili before but I printed your recipe to try it. Looks yummy! Thanks for hosting. Hmmm, I’m intrigued. I have some chicken on the bone in my fridge that I need to use today. I’ve been debating what to make, but I think I like this idea. I just need to get the beans, and I’m set! Your White Bean Chicken Chili sounds wonderful, and I love that it can be made in the slow cooker too. Looks like Grace really enjoyed it 🙂 This week I have shared a delicious pumpkin cake recipe. Thank you for hosting! Hey Lisa! Great sounding chili! I make one too, but mine is just a little different 🙂 I’m sharing Gluten, dairy, and egg free french toast today. Go Daddy was having some issues yesterday and my site was down for awhile. Hopefully, no one will have any problems getting in today. Have a great week! Previous post: 18 Years and Counting…. Next post: Are you in need of a healer?